First up, the thing to remember is that Sydney suits just about every family type. It’s a city that’s packed with entertainment, tours and plenty of activities for every age range to experience. With it’s abundance of wide open spaces, natural beauty and world class sightseeing attractions, Sydney is, in short, one giant family playground. For families wanting to get up close and personal with animals, you’re spoilt for choice in Sydney. 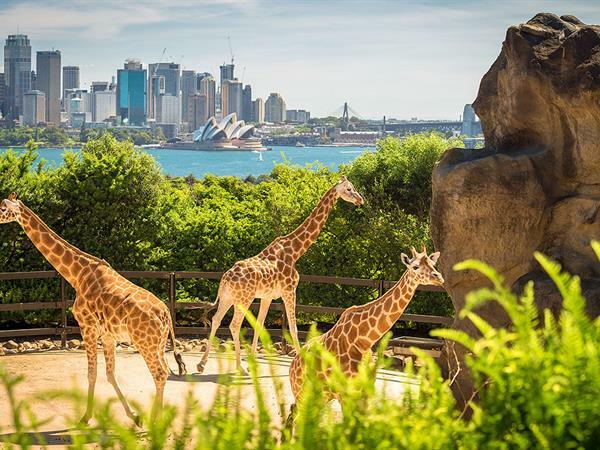 Taronga Zoo has an impressive array of wildlife, as well as spectacular views over the city. WILD LIFE Sydney Zoo is centrally located in Darling Harbour and allows you to encounter Australia’s most loved and unique animals. SEA LIFE Sydney Aquarium and Manly SEA LIFE Sanctuary are great for viewing a large variety of aquatic wildlife. For families opting for a little more culture, Sydney is packed with museums, such as the Australian Museum, the Powerhouse Museum and the Australian National Maritime Museum. Then there’s Madame Tussauds for getting up close and personal with wax replicas of famous celebrities, the Sydney Opera House for a family friendly show, and the Sydney Tower Eye for incredible 360-degree views. For adventure seekers, you can experience BridgeClimb Sydney, step back in time with Sydney Harbour Tall Ships or spend the day as an Olympian at Sydney Olympic Park. You can even take advantage of Transport NSW Family Funday Sunday fares, offering discounted travel for families using buses, trains and ferries. These passes can take you anywhere, from Luna Park out to Western Sydney for thrills at Wet n Wild Sydney or Penrith Whitewater Stadium. Giving kids their own (robust and child-friendly) camera encourages them to observe their surroundings and focus on what interests them. You might be surprised by the knee-high results, which give you an entirely different view of Sydney. Children dressed appropriately will obviously be more comfortable as they make their way around the city. The key for sightseeing is layers, as while it may be warm outside, air conditioning can make the indoors significantly cooler. The same goes in winter, when heating can cause kids to get hot and bothered in too many clothes. Sightseeing often calls for lots of time spend on the feet, so ensure comfortable shoes are worn. No one likes traipsing around the city with blisters. If your child is in the middle of toilet training, consider packing pull-ups which won’t set your toddler back but will make dealing with accidents much easier. Sightseeing and toilet training generally don’t mix all that well, so pull-ups are probably your safest bet. Most kids will love the novelty of riding a train or bus, so ditch the car and opt for public transport instead. Sydney’s public transport system is fairly easy to navigate, and lots of sights are much more easily accessed by public transport, so there’s little reason to take the car anyhow. Young children are curious, and therefore like to explore and touch most things within their reach. As well as packing hand sanitiser, consider packing antibacterial wipes for cleaning high chair trays, seats and other germy spots. Keeping a travel diary is an excellent way to remember a trip and can give the kids something for news once back at school. As you move around, encourage them to collect things like museum postcards or brochures and write a few words on the back to remind them of the experience. You never know what’s going to happen on a big day out, so prepare for the unexpected. Pack Band-Aids, antihistamines, and children’s strength painkillers, just in case. Speak to your children about the importance of staying close to you. The last thing you want is your child to wander off in a large, unfamiliar environment. The best way to avoid sulky, reluctant teenagers is to involve them in the planning of your activities. Ask them to choose from a range of activities or talk to them about what they’d love to experience whilst in Sydney. They may just surprise you and suggest something you’ll all love. Even if you don’t use a pram at home very often, consider packing one for a big day of walking. Little legs get tired fast, and a pram can be your lifeline when fatigue sets in. When choosing a pram, look for one that’s lightweight and easy to manage. Snacks are an excellent way to avoid meltdowns and as everyone’s eating schedules can be off when holidaying, snacks should be a priority. If you’re planning on queuing to get into somewhere, snacks are especially important to help pass the time and keep energy levels high. As lovely as it might sound to pack a full day of sightseeing in, you need to make time to relax too. Consider packing a picnic lunch and head to the Botanical Gardens for lunch for example. This way the kids can have a run around in the sun and enjoy some free playtime while you can relax and have some downtime. Trust in the concierge desk and you’ll be amazed at what they can come up with. Most concierges will happily arrange reservations for family-friendly restaurants, tickets for family-friendly shows, transport, excursion bookings and more. There’s no harm in asking! With Sydney being the home of excitement, there’s plenty to see and do. But even so, you need to choose carefully. For example, taking toddlers to a contemporary art gallery may not be their activity of choice, so their patience may be limited. Kids move slower than you do, especially the little ones. And as frustrating as that may be, it’s their way of taking everything in. If you rush them, they won’t enjoy the experience and that’s when you’ll hear complaints. So let your kids guide you rather than the other way around. Always have an alternative plan (or two) should things go awry. You might have your heart set on eating at a certain restaurant, but if there is an hour wait for a table, you may need to choose another venue. Also, never underestimate the power of a playground. You might think stopping at a playground instead of strolling through the Chinese Garden of Friendship is a waste of time, but to your child, this could be the most memorable part of the trip!